Made popular in the 19th century, the grapefruit tree boasts attractive dark green leaves, white flowers and round yellow/orange-skinned fruits that are a good source of essential vitamins and minerals. 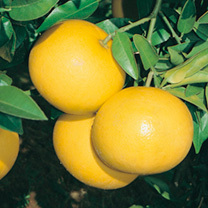 Supplied as a large specimen in a 5 litre pot, will begin producing fruit within 18 months. Plants despatched from 1m-1.5m tall. Packed with vitamins & minerals!